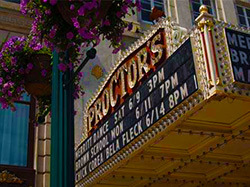 Proctors in Schenectady, NY offers two theatre facilities: The Mainstage and the GE Theatre. These spaces ensure there are always great shows to see! Theatre performances at The Mainstage include touring Broadway shows, world-class singers, comedians, dance ensembles, orchestras and other popular shows. This beautifully restored theatre is listed on the National Register of Historic Places. The Mainstage at Proctors seats over 2,600 people. The GE Theatre seats 436 and is often referred to as a "black box" theatre. The 35' by 50' screen offers a great space for movie screenings and "ilearn" programs for children. Proctors Theatre underwent a $30 million expansion and renovation in 2007. Mariah Carey's music video "Hero" was filmed at Proctors! In 1930, Proctors hosted the first public demonstration of television with the help of General Electric.